Fully automatic sawing machine for production cutting of steel bars, includes an automatic loading table with adjustable incline for rounds, squares and rectangles. The heavy blade guard incorporates 3 sets of carbide pads to guide and stabilize the thin saw blades thereby assuring accurate cutting. 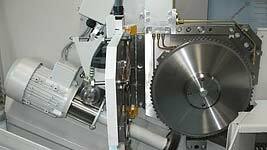 A power-driven brush with automatic wear adjustment removes chips from the teeth of the saw blade. 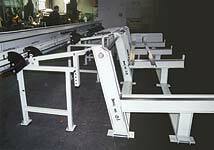 The bar support rails are adjustable in height so that round and square bars can be loaded. Hydraulically actuated loading discs gently place one bar at a time onto the infeed track. A bundle unscrambler can also be provided to keep the storage table filled. 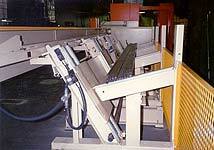 This gripper-type feeder is used to advance the bar for the desired cut length. It also serves to spread the cut so that the saw blade can retract without contacting the cut surface. 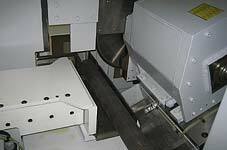 The gripper is also used for making an automatic trim cut. 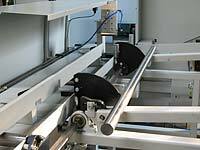 Long cut lengths can be programmed by multiple indexing. 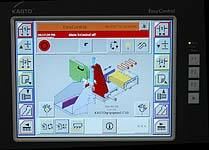 All machine functions and programming are managed by means of the "KASTOeasycontrol" touch screen. 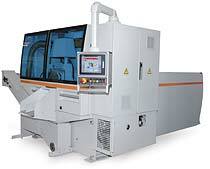 Such functions as cut length, quantities, blade speeds and feeds, feed stroke, and fault diagnostics are included.